This triumphal arch was built to commemorate the event when the 71st and last Grand Master of the Order Ferdinand von Hompesch zu Bolheim declared Żabbar a city – Città Gratiosae Hompesch. Hompesch visited Żabbar in 1797 and it was only after the French were expelled that the arch was built. However, any reference to the Grand Master within the design of the arch was avoided purposely since the political context was too sensitive. 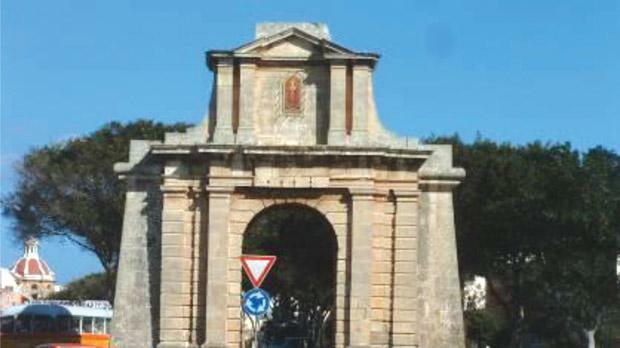 The arch was built just a few years after the de Rohan Gate in Żebbuġ. The entablature of the Hompesch Gate is capped by a triangular pediment and a set of projecting plain Doric pilasters form a plain central panel. A religious motif has been inserted within this plain central panel. The lower part of the gate is also characterised by a number of Doric pilasters. Hompesch Gate, was scheduled by Mepa as a Grade 1 national monument as per Government Notice number 1082/09 in the Government Gazette dated December 22, 2009.